Messi's record-breaking brilliance over the last six seasons at Camp Nou cannot be understated, but until he wins the World Cup, he will never fully stand the comparisons. 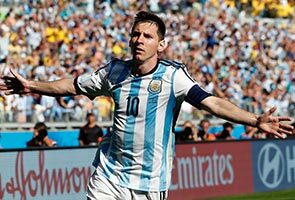 RIO DE JANEIRO: Argentina's Lionel Messi will never have a better opportunity to prove he is one of the greatest players of all time than in Sunday's World Cup final against Germany. For all the breath-taking goals and teeming towers of silverware he has accumulated with Barcelona, it is in the World Cup final that the true greats confirm their legacies. From a 17-year-old Pele in 1958 to Andres Iniesta in 2010, via Diego Maradona, Zinedine Zidane, and Ronaldo, football's biggest personalities have bent the sport's biggest occasion to their will. In the words of Roberto Rivellino, one of the stars of Brazil's 1970 World Cup-winning side: "If Argentina win, he'll be up there with Pele and Maradona, no doubt." Maradona, in particular, was defined by his World Cup performances and at 27, Messi could not ask for a more perfect chance to emulate his predecessor in the sky-blue and white number 10 shirt. Maradona was almost marked out of the 1986 final by West Germany, only to create the winning goal for Jorge Burruchaga, but while he had already dominated the tournament, Messi needs a signature display. Whereas Maradona scored decisive braces against England and Belgium in the knockout phase -- each featuring a memorable solo goal -- Messi has not added to the four goals he scored in the first round. And while he remains Argentina's most important player, his performances have waned. Decisive against Switzerland in the last 16, where he created Angel di Maria's extra-time winner, he showed flashes of brilliance against Belgium, but was a peripheral figure in the semi-final against the Netherlands. His appearance against the Dutch took him to 92 caps, which is one more than Maradona obtained, and yet his achievements currently pale by comparison. In his 91 appearances, Maradona played at four World Cups and carried Argentina to two finals, turning the 1986 tournament into his own one-man show. In contrast, Messi, as Holland coach Louis van Gaal observed, "hasn't always pulled it off" at international level. So should he drift through the final, as he did the semi-final, but still end up a champion, can he be said to have matched Maradona? Judged against the lofty standards that Messi's talent demands, the trophy alone may not suffice. Despite Germany's pedigree -- unequivocally demonstrated in their 7-1 annihilation of Brazil -- the conditions could otherwise scarcely be more favourable. Messi is fully fit, wears the captain's armband, and is the creative hub of a team specifically calibrated to make him shine. After Argentina laboured to beat Bosnia-Herzegovina in their first game, Messi successfully petitioned coach Alejandro Sabella to ditch his experiment with a 5-3-2 formation and revert to the 4-3-3 shape used during qualifying. Sabella has also granted him the freedom to develop a new low-intensity style, whereby he ambles around the pitch at walking pace before suddenly and devastatingly sparking into life. Both of Messi's previous World Cups ended at Germany's hands, with a penalty shootout defeat in the 2006 quarter-finals followed by a chastening 4-0 drubbing at the same stage four years later. Personal vendettas, however, do not appear to motivate the softly spoken forward, who declared after winning his third Ballon d'Or in 2012 that all he wanted was for "people (to) remember my football". His 354 goals in 425 games for Barcelona -- not to mention the three Champions League titles and six La Liga crowns, amongst other trophies -- have already made sure of that, but what is at stake on Sunday is undisputable sporting immortality. As he wrote to his followers on Instagram after the penalty shootout victory over the Dutch: "We have one little step left."